Melissa Livingston studied commercial art in College, winning first place for graphic design in the Art Directors Club of Metropolitan Washington. Upon graduating she worked for publishers Thomasson-Grant in Charlottesville, Virginia as a book and calendar designer. After taking a break from design work to raise her five children, Melissa returned to the world of design, shifting her focus to bookbinding, mixed media art, and letterpress printing. 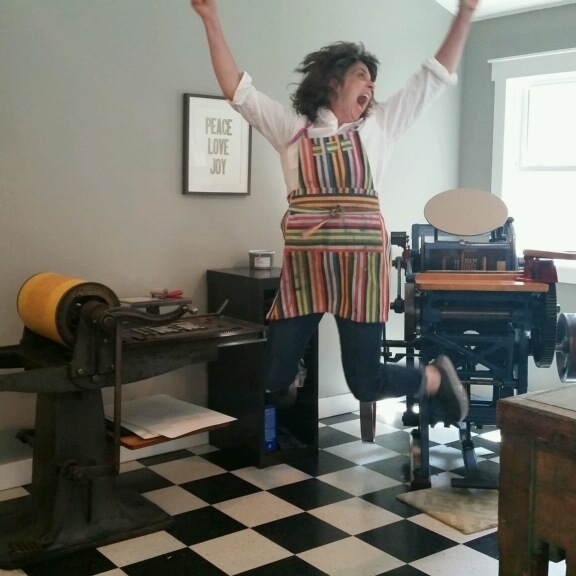 In 2012 Melissa opened Livingston Letterpress in her garage and in 2014, moved to her dream letterpress studio. She has enjoyed collecting a wide variety of antique and vintage printing equipment, finding great joy in her work and in life. Melissa lives in Virginia with her husband and youngest daughter. She makes frequent trips to visit her other children who she wishes were young enough to still live at home.